The Feminine Gift: What I Wore this Sunday! What I Wore this Sunday! I'm going to try something I've never done before - link up with Fine Linen and Purple for What I Wore Sunday and then talk about fashion (which we sometimes do here at The Feminine Gift). Ever have one of those mornings where you just don't know what to wear and you end up changing at least once, but sometimes two or three times? Well this morning was not one of those mornings. I woke up and knew what I wanted to wear - and this was it! My husband said I looked cute, and that he liked this outfit, and I remember the last time I wore it he said the exact same thing - so this one's a keeper. It's been extremely cold lately, like in the minus 30 to 40 Celsius range (for you Americans out there, that's like minus ten thousand degrees), and today was the first day in what seems like an eternity that the temp outside was only moderately chilly and it was SUNNY!!! So I was able to wear this outfit which is only moderately warm (and could take the picture outside without my nose freezing immediately and falling off my face). Pretty much the entire outfit was thrifted or found or given and have weird brand names - so I have no idea where each piece actually came from - except the boots (which you can't see, which we tried to get in the picture) were bought new from some back-woods place and I have no idea what brand they are. But there you are. I wore this to church this morning and felt great in it. I love cranberries and grays in the winter. You look lovely! A beautiful outfit Sarah,and a wonderful way to positively comment on fashion. You do look lovely, and I'm very glad it was no longer minus ten thousand degrees so this picture could be taken with your nose intact. Hey thanks friends! 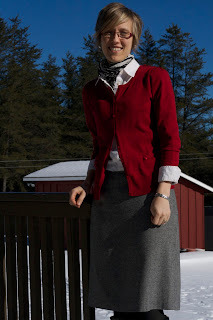 I love a good pop of red in the shades-of-grey world of Canadian winters. I can't believe you did this. I saw you at mass and thought, Sarah should participate in WIWS. I am not joking. Lovely color combination my friend!! You look so smart and well put together. Beautiful!! Elena - that is so funny because I think that about you too! And Mary - thank you, very sweet of you to say. What a lovely outfit! I'm sorry it's so treacherously cold, but a stylish scarf and cardigan can make up for it. Cute outfit Sarah! While chatting outside after Mass bundled up in our down coats I didn't even so much as get a peek at it (except your boots). Maybe we need to sit over on your side of the church for some outfit inspiration!